Godhra city has become most popular for its awesome dishes. These Godhra dishes usually have a very good taste which makes it different from other Indian food. These dishes of Godhra at Gujarat are neither too spicy nor too sweet compared to dishes of other states. You will find wide variety of Gujarati dishes that is prepared at home as well as in restaurants. Like other dishes prepared in different parts of India, Godhra cuisine is also extremely delicious. Such Godhra cuisines are said to be prepared out of green leafy vegetables along with the pulses and spices that are sprinkled all over the rice and a range of breads or papads to give amazing flavors. Most common type of rice is Pulav which has become very common throughout the country. Gujarati food is high energy based food, that is cooked using the same kind of vegetables, pulses as well as spices that other is found in India and abroad. But, the method of preparing or cooking the food was slightly different in earlier years. Later, as the years passed Gujarati dishes are found in all parts of India, and is prepared by all Indians. Also, these type of cuisines are blended with other food to make a new dish. The staple food of Godhra includes vegetables which are actually steamed, and these cuisines vary every season as per the availability of the vegetables; same as other states in India where vegetables such as sweet potato, etc. may not be available in all season, and it varies from season to season. During the summer, spices like black pepper and other spices are used in reduced amounts, so as to minimize the heat inside the body! It is also said that most of the Godhra dishes are found to be too sweet, compared to dishes made out of salt and spices. Even these people use jaggery instead of sugar. ‘Vaghaar’ is a mixture of spices, which is fried in hot oil later added to the dal. To avoid the body from getting dehydrated, more amounts of salt, sugar, tomatoes and lemons are used. 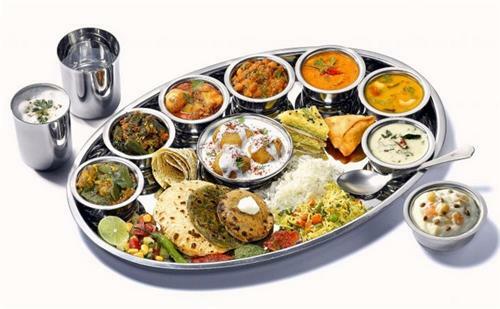 Another interesting matter about Godhra serving system is that, Godhra meal is served on big silver platters or on the stainless steel thali. This type of ‘Thali’ which is also known as platters contains different ingredients – one type of dal, Kadhi (a curd preparation), minimum of 2 to 3 vegetables, such as beans and pulses, the salads, chutneys, rice, and so on. Serving system is too good in Godhra, which consists of several items including sweets like gulab jamun, basundi, rasmali, etc. and dal, buttermilk, curds, rasam, sambar, and some bhaji, including rotis, chapatis, puris, papads, pickles, and many more at a single Thali. You will surely enjoy the yummy Gujarati dish if you visit Godhra. This kind of traditional Godhra food is basically vegetarian that has a high nutritional value. 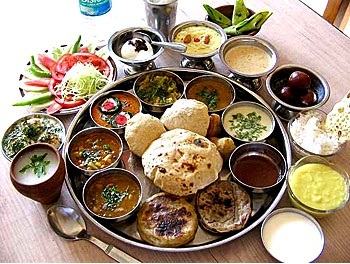 The typical Godhra thali consists of various types of delicious dishes, and each dish has an absolutely different cooking style. Some of these dishes are fried, while other dishes are boiled, and served on a silver platter. Also people of Godhra use different spices to create varied flavors to the meals they cook, due to this reason food becomes really exotic. These are just a regular food, but during festivals and other special occasions, you will be lost eating the food; its just amazing. Some of the most popular Gujarati foods include – Undhiu, which is a spicy mixture of vegetables; Thepla, which means a spicy wheat pancake; bhajia, a fried split pea flour balls; gathiya, a long stick made out of split pea; and other farsans snack items that becomes famous in Godhra. Like other Indian dishes, people of Godhra eat rice with curry; even rice is eaten by sprinkling spices over it; whereas, sweets can be consumed with puri; also curry, dal and other vegetables can be taken with chapattis or rotis or anything that sounds interesting. In today’s world, many youngsters have developed their own eating habitats such as – eating Spicy and Oily food, especially its due to the modern chef who blend Western food with Gujarati food to make the food yummier. Preparing dal is quite simple and interesting – chana dal will be grinded thoroughly with required amount of salt, garlic, cumin seeds, bay leaves, and green chillies as per the quantity; and tomatoes can be added if required. Later mustard seeds and bay leaves will be fried in a oil that is put in a pan. Then, blended dal can be poured to this fried mustard seeds and bay leaves, and mixed properly with a spatula. 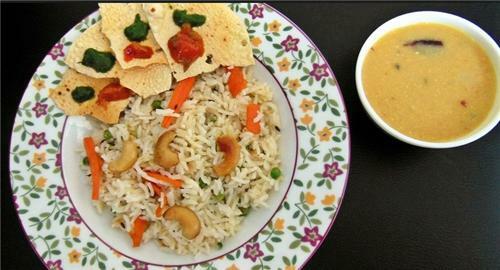 It is so easy to cook and served with chapatis and rice usually. 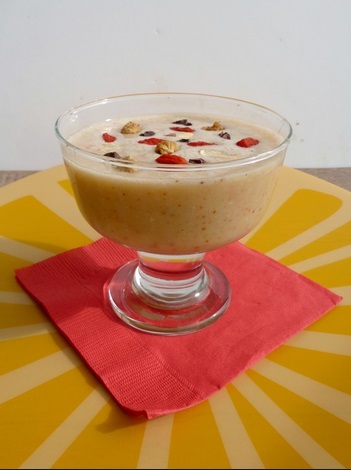 Ancient Desserts will be served especially during the festival and other special occasions, but now it can also be found in the daily meals as well. Popular sweets in Godhra includes – Basundi, the Doodh Pak, the very delightful Gajar Halwa, the Ghoogra, also the Gol Papdi, the most common mouth watering Gulab Jamun and Jalebi, the Kansar, Kopra Pak, the Ladoos and Lapsi, Magas as well as Mawa Ghari, the Mohan - Thal, another delicious sweet called Moong Dal Sheera, even the Puran Puri, and other very common dishes like – Sheera (Sooji), Sheera (Wheat Flour), and even the Shrikhand as well. Apart from Sweets, even most of the snacks are famous such as – Bajri Wada, the very common Batata Wada and Bhajias or Bhatata Bhajias, Green Chilie Bhajias, the Chana Dal Wada, also Dal Wada and Dhokla. Visitors to this city can also find Farsi Puris and Ratalu Puris as well as Gandhias, the Gota, Green Peas, the Handvo, the very tasty Kachori and Khandvi, Leeva Ni-Kachori, the Makai Chevda, the Muthias and Patra, the Sev-Khamani, one can also have tastier Sev-Usal and the Suri Oondhyu too. Along with Sweets and Snacks, you can also consume Pulses (Dals) which include – the Kadhia, the Mixed Dal, the delicious Moong Dal, visitors to Godhra can also consume Plain Dal as well as Tuver Dal. Also, most popular vegetables or sabjizs consists of Batata Suki Bhajis, the Cabbage Peas, also the Cualiflower-Green Peas, and Methi Mutter which are very famous in Godhra. There are also popular drinks which are most commonly found throughout the globe such as buttermilk, curds, and other cold and hot drinks. People of Godhra city usually fast on daily basis or consume limited food, and their diet includes milk, nuts and dried fruits. Some of the most famous beverages are – buttermilk and tea; while, laddoos and mangoes are consumed as the sweet dishes. You can find such sweet dishes in many shops at Godhra that showcases the most delicious sweets of different states and attract several tourists. Though, sweets are not good for dieting, they are consumed as breakfast by most of the people especially tourists who wish to taste different food. While, some people wish to drink buttermilk or drink milk with butter; however they feel comfortable. Even, you can have very common food such as veg salads as well as fruits salads, ice-creams or cold-drinks, snacks, etc. Gujarathi meals are very good to taste and can be found at Gujarati restaurants such as – Vishala, the Rajwadu, and some more restaurants like Athithi, the Dadima, as well as the local favorite Pakwan. 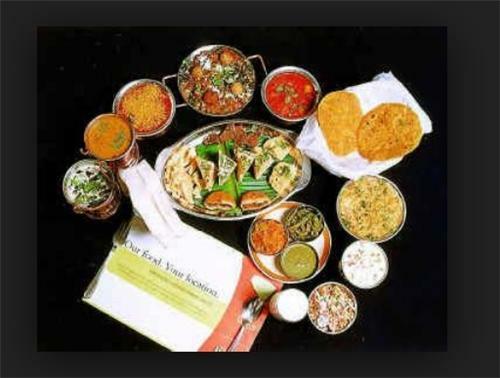 The Gujarati food services at these restaurants are very delicious and dishes will be served in steel thalis (dishes), sometimes glass dishes and bowls similar to restaurants all over the world. No matter in what way they serve either through steel platters or glass plates, silver thalis or fiber dishes, you will be pleased with the variety of delicious food that is decorated in just a single dish!